After much speculation, it appears the long awaited rematch between welterweight king Georges St-Pierre and Josh Koscheck will take place at UFC 124 on December 11th inside the Bell Centre in Montreal, Quebec, Canada. The mulligan itself, as well as the date were previously announced. However, UFC president Dana White confirmed the event’s location on Monday with MMAFighting.com. GSP sells out practically every arena he enters, but the Canadian sets records when he’s showcased in his homeland. Expect for this to be a standing room only event as well. The champ has fought in his own backyard only once before as a member of the UFC roster. He steamrolled Matt Serra to recapture his 170-pound crown at UFC 83 back in April 2008. UFC 124 marks the second Octagon event in Montreal this year. UFC 113 was held there this past May. UFC 97 in April 2009 was the organization’s only other show in Montreal. St-Pierre took a hard-fought unanimous decision over Koscheck in their meeting at UFC 74. It was his first fight since being humbled by Serra just four months prior, but more importantly, the debut of the new St-Pierre. 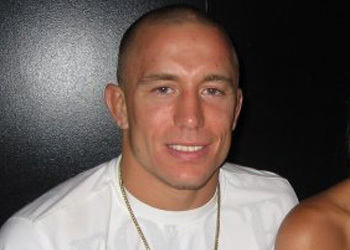 GSP 2.0 has executed a much more conservative, yet smart and dominant, attack en route to collecting seven consecutive wins and recapturing the title. Koscheck posted a convincing unanimous decision win over Paul Daley at UFC 113 in his last outing. The victory earned the controversial wrestler coaching duties on “The Ultimate Fighter 12″ opposite the planet’s baddest 170-pounder, as well as the next shot at his strap.